WOW, it has been a long time since my last recipe for the blog. This summer, life took a quick turn and decided to roll along at a pace a lot closer to whitewater than my preferred speed, lollygaggin’. Mr. Tummyrumblr and I started looking at houses to buy out here in Portland, assuming that it would take us a year or more to find a spot (that seems to be how it works around these parts), however, fate intervened, and six weeks later we were signing loan documents and renting a moving truck. Long story short, I’m back (and you’re back – thank you), and I’m looking forward to posting with much more frequency. In addition to the move, another summer highlight was an offer from USA Pears to write several recipes to help bring excitement to the 2013 pear harvest. I was thrilled with the opportunity, not only because pears are such an integral part of Pacific Northwest cuisine, but because I’ve been wanting to get into professional recipe writing outside of my own blog. Creating delicious recipes with a new and exciting combinations of ingredients is one of the most fulfilling things about my line of work. So without further ado, here is my latest pear-related recipe: A gorgeous, multicolor, fall-inspired gratin that will make a perfect side dish for any holiday gathering. Preheat the oven to 375 degrees. 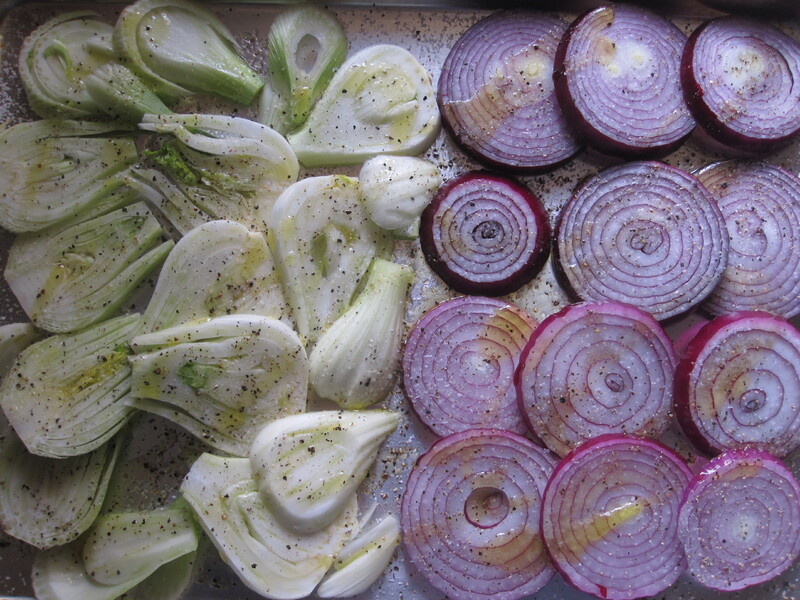 Lay the onion and fennel slices out onto a sheet pan in a single layer. Drizzle with the olive oil and season generously with salt and pepper, turning the slices over to coat both sides. Bake at 375 for 25 minutes or until the vegetables are just tender, and then set them aside to cool. Increase the oven temperature to 400 degrees. Grease a glass or ceramic 12 inch pie dish or 9 x 13 baking dish with the butter and set aside. Peel the skin from the neck of the butternut squash. 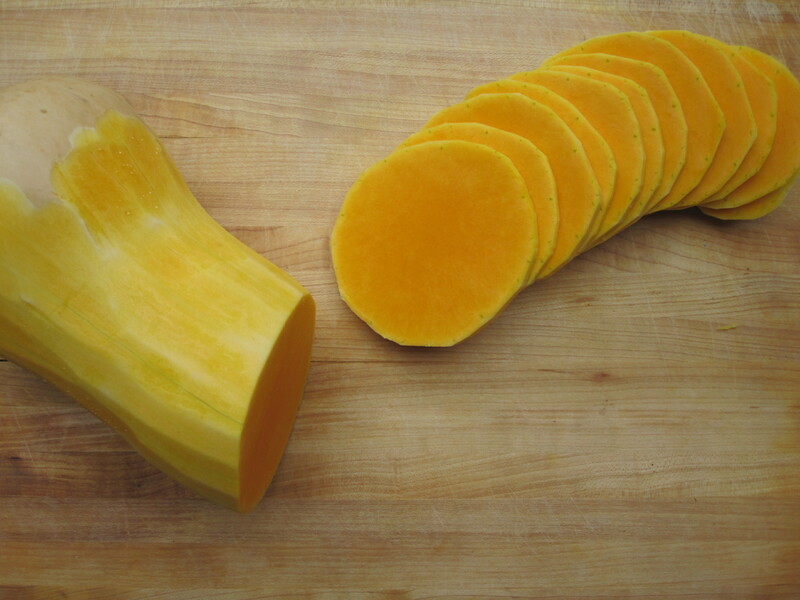 Starting from the stem end, slice the squash into ⅛” slices until you have 20-24 slices. Reserve the base of the squash for use in a soup or stew. Slice the pear into slightly thicker ¼” slices, cutting around the core. Set both the squash and pear slices aside. Place the cream, nutmeg, a generous pinch of salt, and several more turns of pepper into a heavy-bottomed saucepan over medium heat and warm until just simmering. In the meantime, begin layering your squash and pear slices in your baking dish. Alternate the disks of squash with the largest pear slices. Use the smaller pear pieces to fill in any gaps, and cut down some of the squash slices if necessary. Next, top the pear and squash with the fennel, spreading it around evenly. 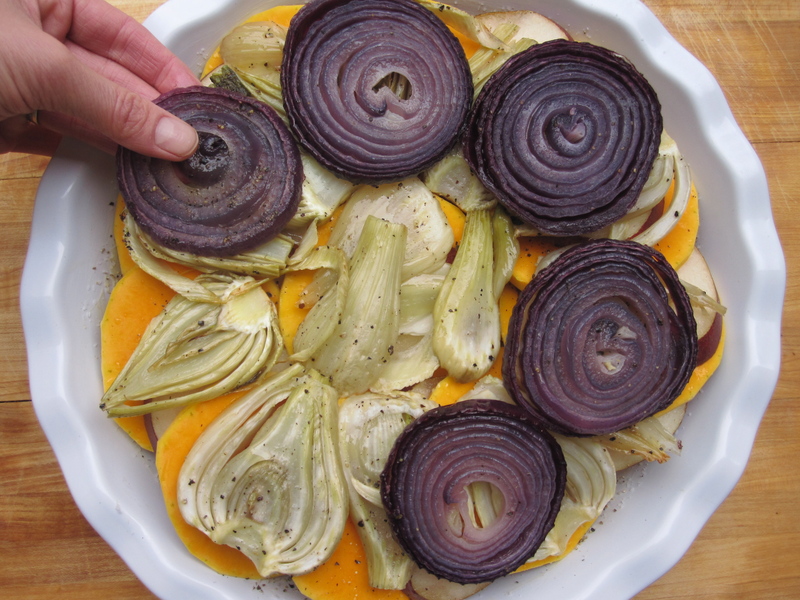 Top the fennel with the red onion in an attractive pattern. Lastly, pour the hot cream mixture over the top of the layered vegetables, being sure to get it into every nook and cranny. The cream mixture will only come up the sides of the vegetables about half way. 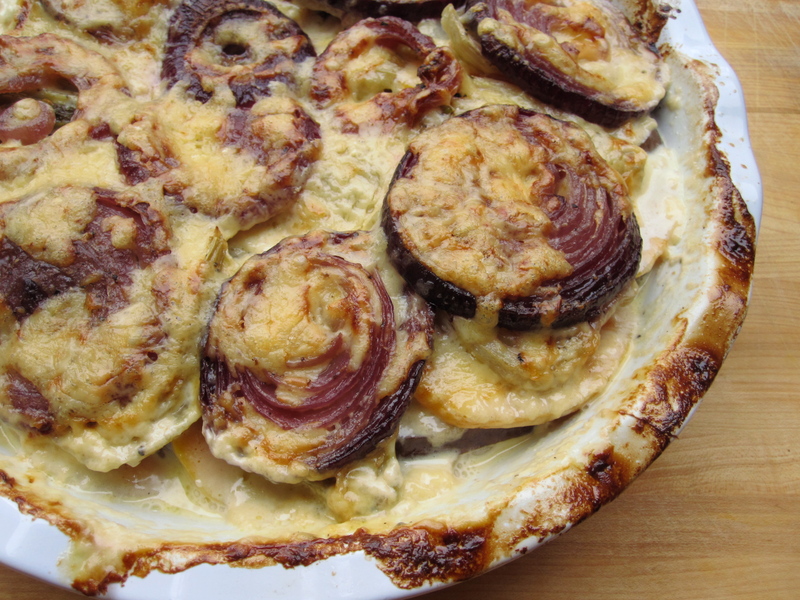 Cover the gratin tightly with foil and place onto a baking sheet to prevent spillage. Slide into the 400 degree oven and bake for 60-75 minutes, or until the squash slices are fork tender. Once they are soft, remove the foil and sprinkle the grated cheese over the top of the gratin. Return it to the oven for 15 minutes, or until the cheese is bubbly and beginning to brown. Allow the gratin to cool for at least 20 minutes before serving. This entry was posted in gluten free, perfect health diet, vegetarian and tagged gluten free, perfect health diet, thanksgiving, vegetarian. Bookmark the permalink.